How Does Utilizing Solar Energy On Your Home Save You Money? For many years, the idea of making the switch to solar was pitched simply because of its environmental benefits. Renewable energy has no carbon emissions compared to pulling energy from your local utility grid which contains electricity that has been generated using more traditional forms of power such as coal and natural gas fired power plants. While this argument alone was enough to convince some to make the switch to solar in the past, others found that it was far too expensive to justify the benefits. Luckily, improvements in technology, paired with increased market supply, have driven the cost of solar down far enough to make it cost competitive with electricity supplied from the grid. So how exactly does solar energy save you money? The only cost of solar energy is that to initially pay for the system. After this, every kilowatt hour generated comes at absolutely no cost to you. This helps homeowners avoid pulling energy from the grid. By reducing the number of kilowatt hours you purchase from the utility, your energy bills each month fall savings you hundreds of dollars every year. 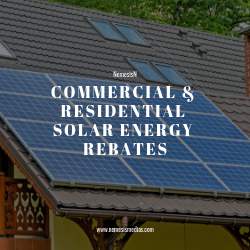 Another way in which solar saves you money is by allowing you to utilize financial incentives. Perhaps the biggest associated financial incentive is the Federal Investment Tax Credit (ITC). This tax credit is equal to 30% of the total installed cost of the solar system. For example, if a 4 kilowatt system were to cost $12,000, the Federal ITC would cover $3,600 of this cost meaning that your total out of pocket cost would only be $8,400. Additionally, many states have additional financial incentives to even further lower this out of pocket cost. One of the best ways to figure out how long a solar system will take to pay for itself is to figure out a rough payback period. To do this, you must first know your average cost of electricity per kilowatt hour. Next, you must estimate the total annual number of kilowatt hours that your solar system would generate. Many Chicago solar contractors can help you to make this estimate using the latest solar forecasting tools. For the purposes of this example, we will assume that a homeowner pays eleven cents per kilowatt hour. This means that a homeowner “saves” eleven cents for every kilowatt hour that their solar system produces because they no longer have to pull this power from the grid. Also, we will assume that their 4 kilowatt solar system produces 5 Megawatt hours or five thousand kilowatt hours of electricity per year and cost the family $8,400 after utilizing all financial incentives such as the Federal ITC. First, you must multiply the five thousand kilowatt hours by the eleven cent cost to get a total annual savings of $550. You can then divide the total cost by this value to receive a rough payback period of just over 15 years. Any electricity generated after 15 years can be seen as “free” given that the system has already paid for itself.